Over the past couple of weeks I have received requests from a number of long-time readers of this blog who would like to offer their Bibles for sale/donation. 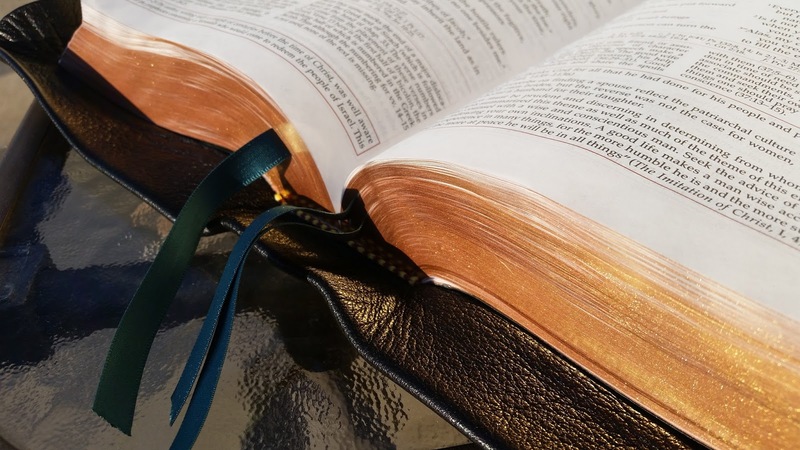 While this is not a marketplace for Bibles, those who have approached me are really only concerned with getting these bibles into the hands of those who will read them. So, over the course of the next few weeks, I will be posting about various bibles that are being offered to you in various ways. 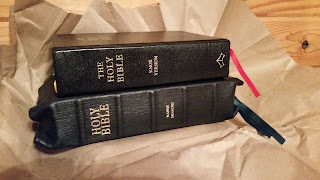 I would like to give my rebound Didache Bible away to anyone who wants it on two conditions: 1) that they will read from it frequently, and not treat it as a decorational item. I think it's beautiful, but I made it to be used for years...I just can't bring myself to do it. 2) that they will make a donation to the Catholic Student Organization at Texas A&M University-Commerce. It can be any amount that they can afford, I would value the Bible at $350 but if they can only give a tenth of that then it's still okay. Really, I just want someone to both treasure and use it, and at the same time help the Catholic students in Commerce. I don't need to know how much they donate; I will send them the contact information of the CSO treasurer and let him know to expect someone to get in touch with him. For more on this bible, go here for a full review of what Max had done. I just bought a copy of the Didache Bible Ignatius Edition otherwise I might make an offer. I don't have a copy of the NABRE, but I don't know if I would read this one frequently because I'm really just looking for a more portable bible. This one would be too thick. Btw going digital with your bible is sooo bad. Does anyone have an extra copy of an RSVCE bible? "Btw going digital with your bible is sooo bad"
Not at all. For one thing, you don't have to worry about the space that they take up, Round about the time that my total book collection weighed about 2 and a half tons, (I wish I was exaggerating, but I'm not), with 3 heavy boxes filled with nothing but Bibles and commentaries, and my entire book collection took up an entire room of my house, I realized that I just can't keep doing it any longer. Plus, my eyesight isn't what it used to be and I have difficultly reading the printed word. An ebook screen is about a million times easier for me to read than a piece of paper. Plus, if an ebook is reasonably well formatted, it is very easy to look at footnotes and whatnot, and jumping back and forth between the text and the footnotes is actually much easier than doing so in a printed book. Emilla, I have two, 1) Catholic Scripture Study Bible in bonded leather and 2) Ignatius large (giant) print in bonded leather. Both are RSV-CE. If you want one of these Bibles, contact Timothy by e-mail and he can pass on your mailing info to me and I will mail it to you, or my e-mail if you have any questions. Anyone have a spare Westminster NT they want to sell? Maybe Biblical Catholic can post an inventory of his (or her) 2 tons of books. Some of us might be willing to take some of them off his (or her) hands! Biblical Catholic...whoa...2 1/2 tons...isn't that like 5,000 lbs.? Now I know the story behind your name. For everyone: I am having some doubts with taking Rolf's offer on the Catholic Scripture Study Bible. I mean I have Bibles. I should just use them. I mean I have a study Bible, but I sometimes open it because I would like a less bulky bible to take to bed (it is the Harper Collins Study Bible btw). I have a Catholic Youth Bible that I barely open because its maps are coming apart and I don't care for the translation (it's the 1970/86 NAB; I really like the new Old testament after looking at online Bible searches, and I do enjoy the New Testament). I have an extra copy of 1970/86 NAB that is actually portable, because it is a personal edition of the St. Joseph edition...couldn't return it because it was a Christmas gift..and before anyone says that I could theoretically return a Christmas gift, please know that it was from my father and sister...they would have seen me returning the bible even if I had the gall to return a Christmas gift. 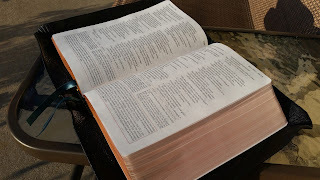 I have a nice size bible in the New Living Translation, which I bought before I had learned more about the Catholic faith and about the Deuterocanon. Not to mention the fact that it is in a format that annoys me--hence, why I do not use it--because it does not meet my needs (it is the One Year Bible for Women published by Tyndale, which provides you with a selection of scripture passages for every day). And lastly, I have a Gideon's ESV pocket New Testament, Pslams, and Proverbs. I have really been needing an old testament in the same hand whenever I hold this ESV. I use this one a lot, especially for its literal translation philosophy. That is why I was attracted to the RSVCE. Well...now that I have written all of this down I actually don't feel guilty anymore for asking for a donation. Yes, I was feeling guilty earlier in the day. Sorry, I already got rid of most of them. Rolf, would you be willing to donate or would you rather sell? If you want to sell, it would definitely have to be a fraction of the total cost seeing as I am a dependent student. Wish me luck (i.e. pray for me) finding a job this summer! Emillia, I was offering it for free. The Catholic Scripture Study Bible is more of an apologetics Bible than an academic study Bible. There are numerous inserts in the Bible such as Catholic Apologetics Bible Verses, and many others explaining our Catholic faith. 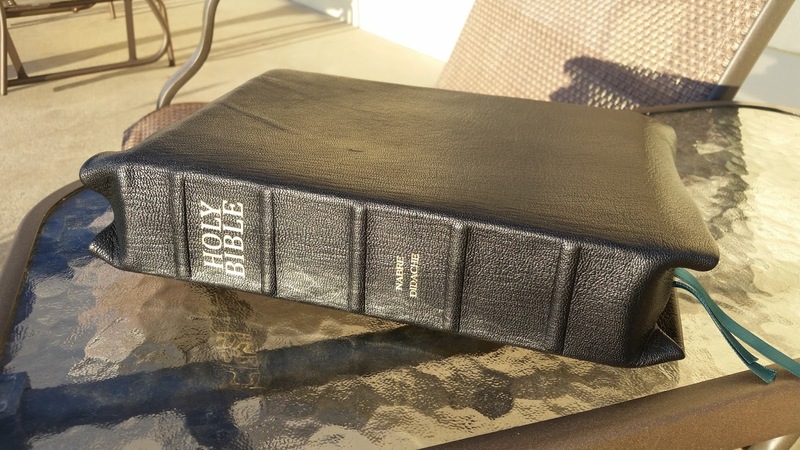 It has three ribbon markers and the Bible has about 11 font size but the Bible is not as thick as the regular study Bibles. Let me know if you want it and email Timothy your mailing address and I will send it to you. BTW I forgot to mention that I find the New Living Translation boring for soooooooome reason, whereas the Good News Translation is not boring for soooooome reason. This is a nice rebind, who did it? Brief update--I've received a lot of interest in the Bible so far, and have decided to give people until Thursday to email me. Then I will use a random number generator to pick who the Bible's going to, that way it can be as fair as possible. If you're interested, please don't hesitate to email me! A few people have asked about making a donation to CSO anyway, and if that's something you'd like to do, again, send me an email. Thanks for all the responses so far! Do you have a list of Catholic friendly Bible rebinders? Not sure what you mean by Catholic friendly. I mean, Leonard's is one option as well as AA leather. 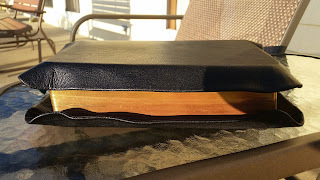 But then there is also a guy (who's Catholic) who started a bible rebinding business last year; he appeared in one of the past posts if this blog. I would recommend Leonard's and Diego Calcoa. Both are Catholic friendly, meaning that they will rebind Catholic bibles, since some will not. @Emilia - I meant a rebinder willing to rebind a Catholic Bible. @Timothy - Diego Calcoa does beautiful work. I wish he had a website for orders. Whoa, I didn't know only some were willing to rebind a Catholic bible. Does anybody know why? Many (most?) protestants think Catholics "added" the deuterocanon and believe this is what Revelation 22:18 was about. I can't imagine that there are many businesses that would be willing to turn down business from a Catholic. Catholic money is as good as anyone else's money. If you want to make money, you don't decline customers. @Anonymous-So basically there is discrimination? Well that's stupid. @Biblical Catholic-I thought so too, that's why I was surprised in the first place with the question. @Biblical Catholic and @Emilia - from their point of view rebinding a Catholic Bible would be no different than rebinding a Book of Mormon or Qur'an and their actions then would be an endorsement of what they consider a false religion (in my experience protestants don't consider Catholics christian but rather a cult).